In the face of a diagnosis of terminal liver cancer, Robin Hopper took on what he considers one of the most important projects of his life. Swansong is two + hours of memoir, musings, demos, a tour of his award winning garden and much, much more. As his final contribution to the ceramics community, Robin wants the impact of Swansong to benefit children. Swansong is $30 with all proceeds going to the British Columbia Arts Programs For Youth and the Jimmy Fund, the pediatric wing of the Dana Farber Cancer Institute. 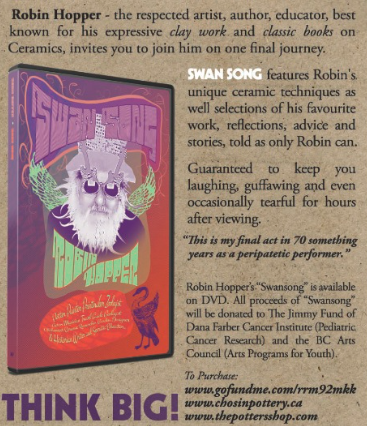 Please help insure Robin's legacy of sharing his knowledge and helping others by purchasing his Swansong dvd. To purchase the SWANSONG dvd please click here to visit our bookstore and fill out the Book Order form or call or email us; 781/449 7687, pottersshop@aol.com. Thank you. "Robin Hopper is my friend. Not an acquaintance, but my friend. Not two guys who happen to have a passing connection, but my friend. Not a pair of clay people who both have beards and who share an occasional conversation at a conference or workshop, but my friend. After sitting with Swansong for just a short while I suspect that you’ll feel like he’s your friend too. 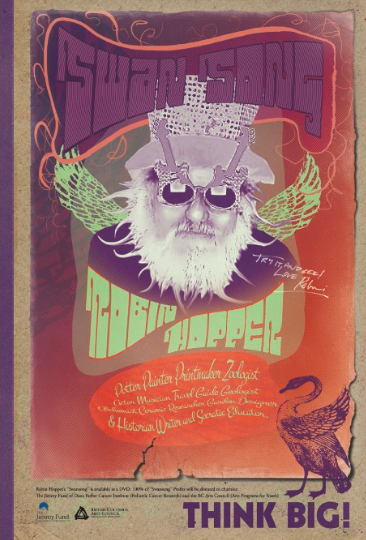 Born in the UK under the clouds of WW II, and then emigrating to Canada as a young man, Robin Hopper has worn many hats, among them; actor, musician, set designer, geologist, travel guide, teacher, writer, storyteller, gardener. A Renaissance Man? In the greatest sense of the word. Despite his varied career, Robin is best known for his elegantly expressive clay work, work that encompasses functional and decorative pottery, sculpture, and garden wares in stoneware and porcelain. He is equally creative with a pencil or brush and his ability to explain and express using the written word has spawned a collection of some of the most significant books on ceramics in the twentieth century, books that occupy studios, schools, libraries and nightstands the world over. It is also a love story–a somewhat unusual love story. It is about passion, intrigue, and obsession. It is a story about a lust for life, a thirst for knowledge, a passion for pots, a mania for mud and minerals and a commitment to furthering the development of ceramic communication and education. So slide in this DVD. Tone down the lights. Caress a hand made mug of home brewed coffee, tea or hot cocoa, and let Robin share with you 76 of the most exciting, provocative, productive, tragic, exhilarating, rewarding, and magnificent years a human being could live. If you felt it too presumptuous to call Robin a friend before, let it go. Meet Robin Hopper, a new friend."